PMS scheduling. The materials required and the procedures followed in schedule preparation are detailed in the paragraphs that follow. MATERIALS REQUIRED FOR PREPARA- TION.The following materials are required: Blank Cycle Schedules (OPNAV 4790/13 or approved automated form). 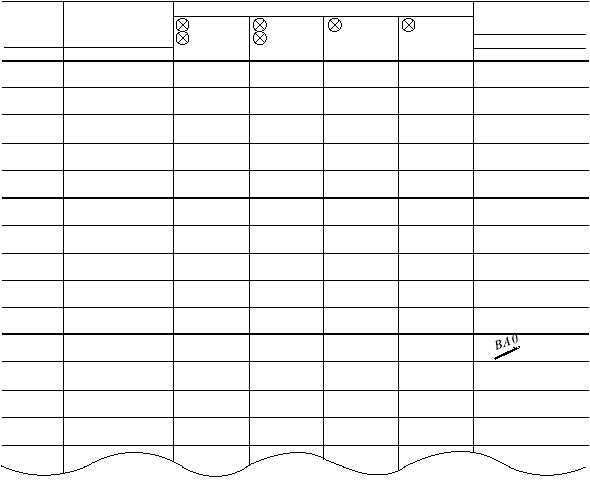 Use of automated forms generated from PMS scheduling programs that have been approved by CNO and the TYCOM are authorized for use in lieu of paper forms Workcenter PMS Manuals (List Of Effective Pages) (LOEP) Applicable MRCs (for general reference) PROCEDURES.The following are basic instructions for filling out the cycle schedule (refer to figure 7-10): 1. Neatly enter initial entries, either typed or in black ink, on the Cycle Schedules. Changes will be made in ink and initialed by the department head. 2. From the LOEP (Report PMS 5), list each item of equipment in MIP sequence. It is not necessary for the Cycle Schedule to match the LOEP line for line. a. Use the MIP column to list the MIP code without the date coding; for example, E-1/55, EL-2/80, and 4411/1. b. Use the Component column to list the name of each system, subsystem, or equipment. Enter the item's serial number or ship's numbering system number in the Component column if more than one of the items is located within a workcenter. Also enter EGL in this column when an EGL is applicable. When multiple EGLs are used, they can either be scheduled on separate lines or be scheduled on the same line (or group of lines) using the EGL number as the prefix to the scheduling code; that is, a quarterly check for MRC Q-1 would be 7-14 SHIP WORK CENTER SCHEDULE QUARTER AFTER OVERHAUL AS INDICATED USS ROOSEVELT CVN-71 MACHINERY LUB OIL NO. 1 AMR 2000/001 MIP COMPONENT MISC SHIPBOARD ELECT EQUIPMENT 3000/001 RECEPTACLES EGL-1 RUBBER GLOVES EGL-1 FIREMAIN & FLUSHING 5210/009 COMPRESSED AIR SYSTEM EA07-001 5510/018 02N2 SYSTEM FWD 1-30-6 5530/001 PUMP 27345 VALVES EGL-1 VALVES EGL-2 18M-1 (6) (18) S-4R A-2 EA07 (pg 1 of 1) S-3R 13 17 21 1 5 9 14 18 22 2 6 10 15 19 23 3 7 11 16 20 24 4 8 12 APPROVAL SIGNATURE DATE EACH QUARTER B. A . Ol s o n LCDR, USN 30 JA N 94 S-2 A-11 S-1# A-13R A-1 A-13R S-2 A-5R# S-1# 18M-1 (12) (24) S-4R S-3R A-14# 2M-6, R-1 S-4R M-1, M-2, M-4R, R-2 2W-1, 3W-2 S-3R, R-1 Q-1, Q-5R# A-5R# M-1, M-2, R-1, R-5W M-1, M-2, Q-2# Q-3, R-16D, R-17W A-13R, R-11M, D-1R, W-1R D-1R, W-1R, A-13R, R-11M CYCLE PMS SCHEDULE (CONVENTIONAL) OPNAV FORM 4790/13 S/N 0107-LF-3220 ABEf0710 Figure 7-10.Cycle PMS Schedule.